While on a site visit in downtown Milwaukee, a West Bend loss prevention associate recognized a fire extinguisher in a restaurant kitchen indicating it had been discharged. This was puzzling because the fire extinguisher had been serviced only a few weeks before. After questioning the manager, a startling discovery was made. In a well-intentioned attempt to test the effectiveness of the newly-inspected fire extinguisher, the manager had taken the canister outside and discharged it. It quickly became clear this process was followed for every fire extinguisher within the facility! If a real fire had broken out in the building, there would have been no viable options for containing the flames because all of the extinguishers had been depressurized. According to the United States Fire Administration, direct property losses due to fires reached an estimated $11.7 billion in 2011. 3,005 people lost their lives as a result of fires that same year with an additional 17,500 injuries documented. If people in the vicinity of these fires had access and been more comfortable with a fire extinguisher, it’s likely lives and money would have been saved. 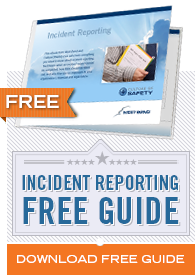 Is your staff prepared to respond safely and efficiently if a fire ignites in your facility? Where are the extinguishers located? Will one person be designated to attempt to extinguish the flames? Who calls the fire department? All of these questions – and more – should be addressed in your business’ emergency action plan. 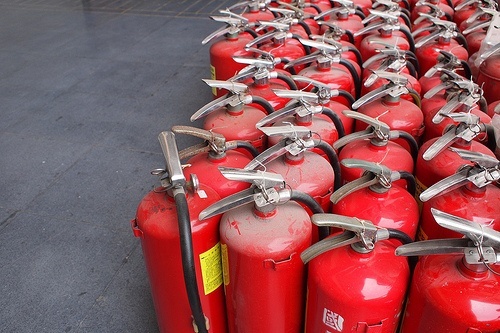 Emergency procedures, including the use of fire extinguishers, should be practiced several times each year. The most important point to remember is that a fire extinguisher should only be used when the situation doesn’t pose a direct threat to the user. Never put yourself or others in a compromising situation in an attempt to pacify an uncontrollable blaze. When misused, a fire extinguisher can actually make a fire stronger and more dangerous. A helpful acronym has been developed to aid in proper procedure in case of an emergency. Users only need to remember to pull, aim, squeeze, and sweep (PASS). Aim the nozzle or hose at the base of the fire from a safe distance. Squeeze the operating lever or handle to discharge the fire extinguishing agent. Sweep the nozzle or hose from side to side until the fire is out, starting at the base of the fire. Move forward or around the fire area as the fire diminishes. Be prepared to respond if the fire reignites. Any time live electrical equipment is believed to be the source of a fire, an attempt should be made to cut power to the area. It’s important to remember, however, that touching electrical equipment with any part of the extinguisher may create a severe shock hazard. Do not store extinguishers in an unsecured and upright position on the floor. If the extinguisher were to fall, a missile-like hazard could be created if the valve is broken off of the compressed cylinder. Dedicated extinguisher boxes in an easily-accessible location are ideal. Also remember to never place an empty or partially-discharged extinguisher back in its location; always replace with a newly charged device.